Today Julian Assange was arrested in London. Scotland Yard says it will honor the extradition request from the United States related to charges stemming from the Chelsea Manning case. Julian Assange is the founder of WikiLeaks which also played a role in the release of stolen emails from the Democratic party in the 2016 election–believed to have been provided by Russian hackers–that helped Donald Trump become president. But its not the first time Assange has left the Ecuadorian embassy in London. 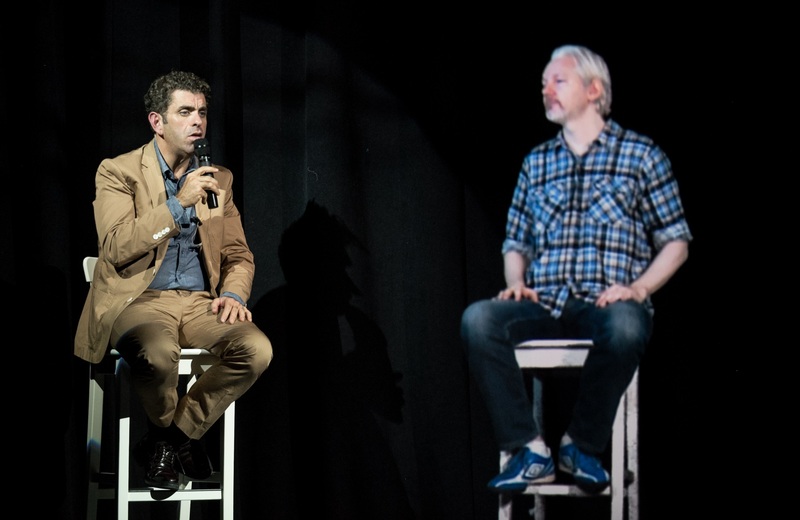 In 2015, Assange was beamed via hologram to the Nantucket Project, a think tank symposium off the coast of Rhode Island. Hologram USA beamed him there, with founder Alki David himself operating the equipment in London. Hologram USA is best known for its dead celebrity recreations of artists such as Billie Holiday and Jackie Wilson but it has been active in politics as well. It helped Indian Prime Minister Narendra Modi win when he appeared in simultaneous hologram town halls in dozens of cities and villages at a time in 2014. Hologram USA also created the stage and ran the tech for the Ronald Reagan Presidential Library’s new hologram homage to The Gipper. Most recently Democratic Presidential hopeful posted video of himself visiting the Hologram USA theater and rapping on stage in hologram form with a virtual Tupac Shakur. At the event, Assange was interviewed by documentary filmmaker Eugene Jarecki about Google, Bitcoin, Privacy, and the state of the free press and democracy. By all accounts they looked like they were sharing the same stage even though the interviewer and guest were thousands of miles apart. Assange even took questions from the audience. At the end they attempted the first transatlantic hologram high five. They missed and became the subjects of a spoof on late night hosts Jimmy Fallon’s show.